I have been using Visual Studio professionally for about a decade now. Jenkins for CI/CD for the last 5 years. While the latest iterations of both are excellent tools (Jenkins pipeline, in particular), my development environment feels stagnant. I use OSX at home, and with our migration to Github now seemed like the perfect time to try something different. 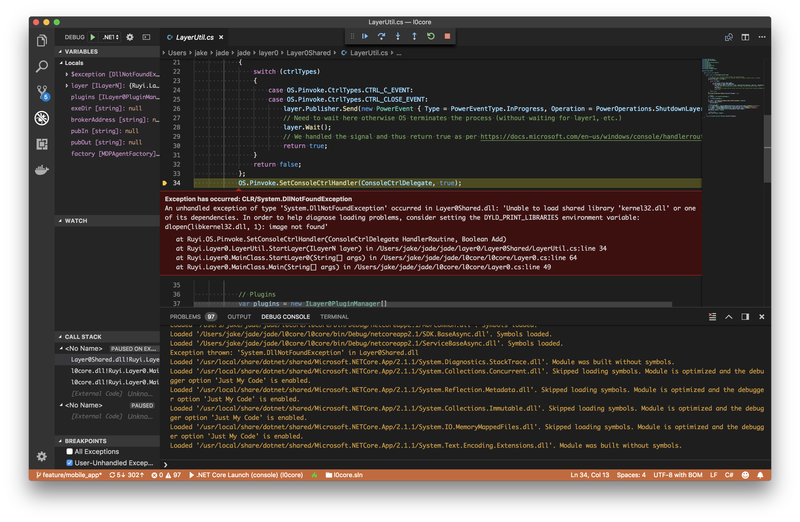 What follows is a brain-dump of stuff I’ve done with a recent github project, nng.NETCore- .Net bindings for nng. In Visual Studio I’m used to adding a project to the solution, then adding references to that project. Visual Studio Code has been my go-to text editor for over a year now. Especially for editing markdown. Could not locate .NET Core project. Assets were not generated. Seems to be this bug. In any case, closing and restarting VS Code seemed to fix the issue. Lacks some source code analysis/linting; unneeded using statements, namespace scoping, etc. Setup Appveyor for both Windows and Linux builds of nng.NETCore. After adding the project via the web interface, either commiting an empty appveyor.yml or clicking NEW BUILD will trigger a build and tests. msbuild "C:\projects\nng-netcore\nng.NETCore.sln" /verbosity:minimal /logger:"C:\Program Files\AppVeyor\BuildAgent\Appveyor.MSBuildLogger.dll"
C:\projects\nng-netcore\nng.NETCore\nng.NETCore.csproj(1,1): error MSB4041: The default XML namespace of the project must be the MSBuild XML namespace. If the project is authored in the MSBuild 2003 format, please add xmlns="http://schemas.microsoft.com/developer/msbuild/2003" to the <Project> element. If the project has been authored in the old 1.0 or 1.2 format, please convert it to MSBuild 2003 format. Done Building Project "C:\projects\nng-netcore\nng.NETCore\nng.NETCore.csproj" (default targets) -- FAILED. Our current project uses NUnit so I’m pretty comfortable with that. xUnit seems to be the only recommended testing framework that isn’t MSTest. Appveyor automatically picked up all the tests without any additional configuration. See Running tests for more information. - sh: dotnet test --filter "platform!=windows"
See Filter Option Details and Running Selective Unit Tests for additional options. Branches shows how to do branch dependent build configuration without creating multiple appveyor.yml files. Deployment covers general deployment topics. The api_key value comes from encrypting my nuget upload token. No github project is complete without flair. While working on OSX it would be convenient to be able to build/test on Windows and Linux without having to push and wait for Appveyor. Enter Docker. docker build -t dotnetapp-dev . Have experimented with Docker in the past. While it was certainly cool, never really went “all in” and made it part of our development pipeline. Now that Windows is supported as a first-class citizen I’ll be giving it another, more serious look.